The balancing of energy supply with demand on the UK National Grid is performed by ELEXON and as a result they provide a live snapshot of the power generated to match that demand by fuel type. I have been monitored this since December 2016. Peak demand in general occurs around 6pm and I use this value to compare the relative importance of different energy sources to energy security. The values provided by ELEXON are for centrally ‘metered’ power supply and do not include smaller ‘feed-in’ sources. Feed in sources are mostly household solar panels, solar farms, and small wind farms. The University of Sheffield began estimating Solar power around the end of 2017 based on their regional insolation/capacity model. I have been monitored this solar value since the beginning of 2018. In addition unmetered ‘feed in’ wind farms are estimated to add ~46% to the larger metered wind farms. This correction is applied to the overall results below. Peak demand in winter still exceeds 50GW despite energy saving measures. Nuclear Power provides a stable baseline of about 8GW. Coal generation remains essential to meet demand during winter months, however most of the bulk generation balancing is now met by Gas. Wind power is extremely variable, but remained strong this winter and contributed an average 10.5% of peak demand or about 4.5GW. Maximum output at 6pm was ~12.5GW, while a record 14GW was recorded in the morning of March 17. This was also due to upgraded power transmission from Scotland to England. Solar Energy contributes essentially nothing during winter, and only becomes a significant factor after April and during daylight. Bio fuel has grown since 2016, but this growth is dominated by the DRAX turbines converting from burning coal to burning wood chips. After November 2017 the demand curve is matched by the sum of all the fuel components, whereas before then there is an apparent small shortfall. I don’t have an answer as to why this is the case, but can only guess that the fuel figures were a little too low before November 2017. The Solar component apparently carries the supply of power beyond real time demand. That is because the effect of solar is to reduce the national demand curve through localised feed-in. However this ‘hidden’ solar is plotted here for comparison to the metered contributions from other fuels. The week 31 May-5 June 2018 saw almost no wind across the UK, but instead a lot of sunshine. Here are the results for that week. Total net Wind output fell as low as 0.05GW on Friday 1st June. Such lulls are not only restricted to Summer months. During the 2013/14 winter wind output fell below 0.2GW at 6pm on three separate occasions. For this reason the UK will need to keep in reserve an equal Gas capacity to that of all installed Wind farms simply to cover such lulls. Nor is it really feasible to store such huge amounts of energy. To cover one day without any wind (5GW) would need store 120GWh (430 TJ) of energy. This is 5 times larger than the bomb that destroyed Hiroshima. The largest Battery storage so far is the one that Elon Musk’s Tesla built in Southern Australia which can store 130MWh of Energy. Unfortunately this is a factor 1000 to small. The cost to the SA government for its installation was around AUD 100 million. Nuclear power looks cheap in comparison! This entry was posted in Britain, Energy, Science and tagged wind power. Bookmark the permalink. Graph indicates coal is entering and leaving the power supply periodically for very short periods. Based on my experience around coal fired power plants in US it can take a day to get a coal plant into operation from a cold start, even a relatively small one. 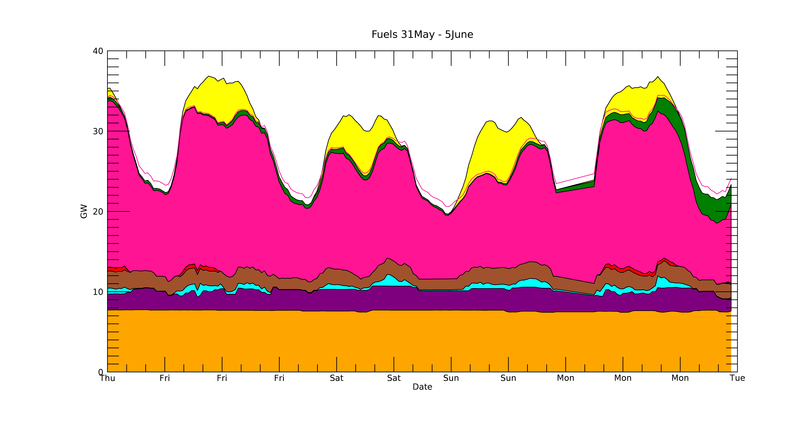 Data in graph suggest UK coal plants fire up and shut down nearly on a whim. Does not look reasonable. It is all carbon politics. I think a small number are kept fired up and held in reserve. They get switched into the grid when supply is short and spot prices high. In winter all the remaining coal stations are needed as the existing gas fleet is insufficient. The problem today is that energy companies are not building new gas plants, again mainly due to politics. It is very hard to understand how the UK arrived at this situation and how crazy dependency on Renewables has become. Surely some when in the near future the lights must go out in the Uk and elsewhere in Europe. I don’t think any realisation will hit until that failure happens and then it will be too late to turn the policy around. Not only are Renewables very unreliable but also they are very expensive. I do not understand how the Western world has gotten gripped by this vast delusion without looking at the simplest numbers. Unless it is a deliberate act of self harm to make Mr Putin happy. Updated 2017 costings from US EIA change earlier cost models significantly. The numbers are just not quite as enormous and the USA Renewables are more efficient (a bit) than in Europe. It is all about virtue signalling. If you work in Government or Academia and you want to keep your job then you go along with the 100% Green Energy narrative. It is a classic case of following the Emperor who has no clothes. Who will be the little boy ? China, India and Russia just play lip service but do the opposite. 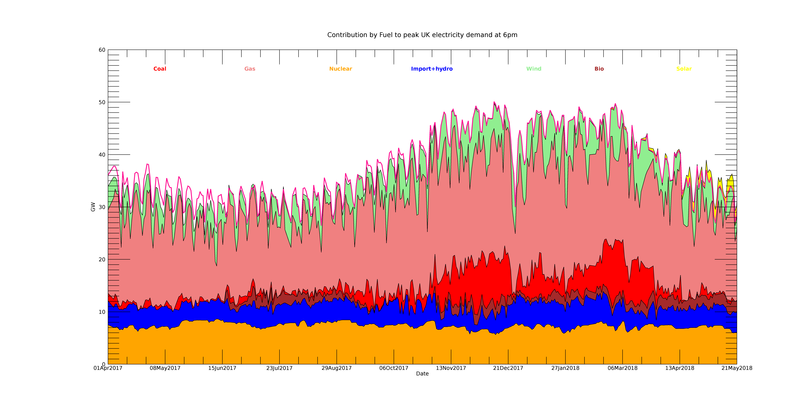 In addition Clive’s posts shows how dependent the UK is on electricity imports. Macron in France is reducing its nuclear capacity by about 1/3. If in the light of this the French will not be exporting power if it needs it for itself some dull still winter evening. Macron could have been the little boy but instead appointed Nicolas Hulot as energy minister ! That’s like putting Caroline Lucas in charge of UK Energy policy. It seems that that there is no retreating from this madness until power cuts start to hit. Then they will all point the finger at someone else. This is what boils my pee about the whole ‘climate change debate’. a think most rational people will agree with. policy and research into energy research.